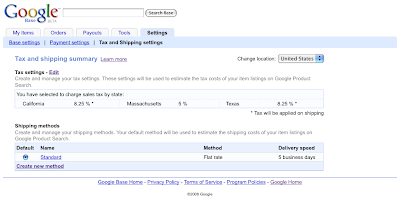 Tax and shipping estimation is one of the features most commonly asked for by shoppers on Google Product Search. Today, I’m happy to announce that you can now submit tax and shipping information for your products via your Google Base account. We'll soon be displaying this information on Google Product Search to provide buyers with more accurate price information, so we strongly encourage all merchants to start submitting it. 1. Set default values directly in your Google Base account. The rates and values you set will serve as the default values for all your items. You can input these values on the new "Tax and Shipping settings" tab under “Settings” in your account. 2. Include values for the new tax and shipping attributes in your data feeds. These values will override any account-level default values that you have set for that item. Please visit our Help Center article for step-by-step instructions and more information on formatting the new tax and shipping attributes.